Fresh peaches paired with brie and basil, or pepperoni and fresh mozzarella, for a savory summer pizza. Luscious, ripe summer fruit . . . blah blah blah . . . nature's candy . . . blah blah blah . . . summer on a slice . . . yada, yada. Look, I could attempt to wax eloquent about peaches, again, but I won't. The point I'd like to make here is that your local fruit, in season wherever you live, tastes amazing. If you happen to live in a region where peaches grow, and you've already had at least a few fuzzy-lipped, chin-dribbled bites of juicy fresh local peaches this summer, consider this pizza. Normally at this point I'd insert a rant about store-bought peaches, but not today, not this time. The local grocery store I walk down to every 36 hours to buy a gallon of milk? We had a tour of their produce section the other day, and as part of the tour my daughter got a local peach, a local pepper, a local early apple, a packet of local herbs, and an ear of local sweet corn. A store that makes a point to source local (to them, that's within a 2 hr drive, with family-owned farms they've been doing business for generations) is a store worth patronizing in my book. Getting a 2 mile walk for me and the dog, freshly roasted Hatch chiles, and keeping the car in the driveway when we're out of milk are all excellent reasons too. The peaches used in these pizza were not from that tour, though. Yes, there are two different peach toppings in this photo. They were both delicious and, like choosing between my kids, I couldn't pick just one. I got the idea for the basil, brie, and peach pizza from this sandwich at Two Peas, and it got me singing Reunited (with Brie) And It Tastes So Good around the kitchen. It looked way too tasty not to try it on a pizza, and I'm so glad I did. The fresh mozzarella, peach, and pepperoni pizza was a bone thrown to my kids. I'd used frozen peaches to make a Peach and Peppadew Pepper Pizza (which is still in the Recipes to Blog About, Though the Photos Predate My Food Photography Challenge list) and knew that a slice of sweet fruit coupled with a salty cured meat makes a terrific topping. Preheat the oven to 425 degrees Fahrenheit, and preheat your pizza stone, too. Don't have one? Use a cookie sheet. On an oiled piece of parchment stretch out the dough into a peach-like shape. Brush the top lightly with olive oil. I was in the mood to not have the crust of Brie cheese because I just finished reading Michael Pollan's Cooked: A Natural History of Transformation (it may make you think twice on aged cheese. Just sayin'). Suit yourself, but put slices of brie across the pizza dough. It's going to run amuck in the oven, and that's OK. Top with sliced peaches. Bake for 5-8 minutes, realize that the Brie has run amuck and you cannot shimmy the dough off the parchment paper and just keep on baking until the cheese is bubbly, another 3-5 minutes. Stack, roll, and slice the basil leaves while the pizza is baking. 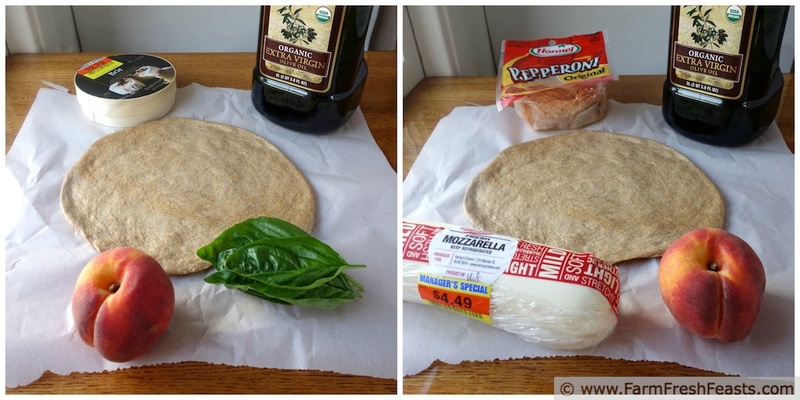 Remove pizza to cool on a rack and top with sliced basil leaves. Slice and serve. Preheat the oven to 425 degrees Fahrenheit, if you use a pizza stone have it preheating as well, otherwise use a cookie sheet to bake. On an oiled piece of parchment stretch out the dough into a peach-like shape, or go crazy and shape it like a nectarine. Brush the top lightly with olive oil. Top with sliced peaches, sliced pepperoni, and sliced mozzarella. Bake on the parchment for 5-8 minutes, then shimmy the dough off the parchment paper and just keep on baking directly on the stone or sheet until the cheese is browned and bubbly, another 3-5 minutes. Remove pizza to cool on a rack. Slice and serve. Basil, Brie and peaches! That sounds absolutely amazing. I love your pizza topping combinations, Kirsten! I'm obsessed with peaches this time of year - we even have a peach tree in our yard that my husband planted for my birthday a few years ago! I'm always looking for new ways to use 'em up, and I LOVE the idea of the savory pepperoni/peach pizza. YUM! Your peach tree in the yard actually produces peaches? We're a bit jealous here. My daughter's peach trees have beautiful spring flowers, lush foliage, and young peaches . . . but some varmint takes them before they get a chance to ripen. I picked 20 lbs of peaches a few weeks ago and never even thought of making a pizza with them, how silly! Wish I could have picked your brain. I think I need another round of peach picking after reading this! My brain is pretty much picked over, but you're sure welcome to give it a shot! Too bad peaches don't have seasons like fall raspberries or ever-bearing strawberries. Now that I've spent a couple of weeks working on them, I'd have to agree with you. I wish I had local produce within walking distance! I'll be making my way to the farmer's market tomorrow morning for sure now, hopefully they have some peaches ready. This looks great! I admit I feel spoiled living here. And I thought we chose this place because of the amazing Graeter's ice cream. Or schools. Something like that. Friends with peach trees and friends with dill seed--those are two biggies for me. I'll be the friend with basil, since I've got more than enough of it and can't seem to get going putting up pesto so I keep taking it to work to share. I can't even tell you how in love I am with pizza #1! I hate to crush your dreams and tell you that we've eaten pizza #1 . . . but you probably have realized that! It was delicious and I'm grateful to Maria from Two Peas and Their Pod for giving me the inspiration for it! Now, ricotta sounds pretty good to me, and I admit the fresh mozzarella over the pepperoni was a nice touch. The brie tasted great--it was just a bit of a dickens in the oven, and I'm glad I'd used parchment paper as it ran all over the place. How come your pizzas always turn out so perfectly round? I love roasted peaches - esp with balsamic. Clever photography angles. That's all. You'll note I'll never tell you to make a perfectly round pizza because I sure can't! Thank you for the balsamic inspiration--next year's peaches will get that treatment! 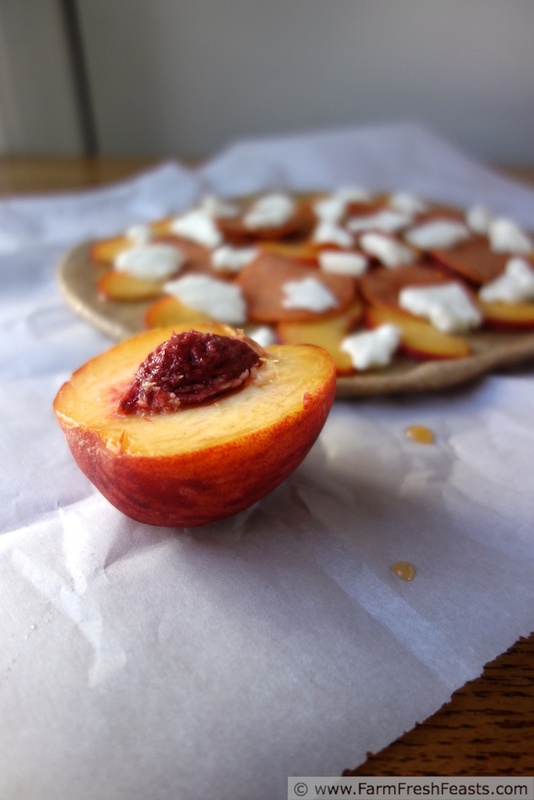 This is a great line: "If you happen to live in a region where peaches grow, and you've already had at least a few fuzzy-lipped, chin-dribbled bites of juicy fresh local peaches this summer, consider this pizza." Even though I don't eat meat, I can appreciate how the salty pepperoni must have complimented the sweet peaches. I bet it was amazing. I'd love to try the one with brie too because well I love brie, high faluting and all. What was in the Michael Pollan book about aged cheese? Do I even want to know? I didn't put you up to praising my line, but I am pretty pleased with it. Thanks! Michael Pollan is just very . . . enthusiastic . . . about describing the various types of mold that colonize the cheese as it ages, and as they die off the next molds that infiltrate the cheese in stages. Almost like time lapse photography in words, if you will. Rose sounds good to me, I can tell you that my zinfandel was also good with this. Yes, yes and yes! 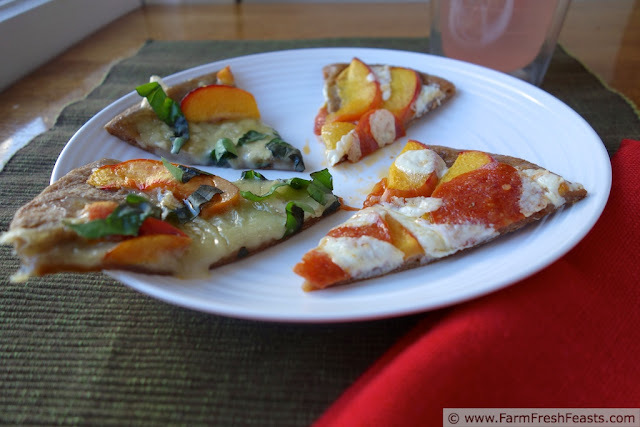 Basil, brie and peaches – definitely! And peaches, p'roni and fresh mozzarella – another yes. Lovely combinations and lovely photos! Thanks for the inspirations! I get so inspired by you and the other food blogs I follow that it's nice to inspire back. Now why didn't I think of that?! They both look amazing,and I can't wait to try them out! You would have thought of this, you were just busy thinking up some gorgeous sewing project (that divided basket is adorable!) and your brain can only handle so much creativity at once. I'm glad to think up the pizzas for you to be inspired by. Pepperoni and Peaches? That sounds amazing, and I never would have thought to put them together. My daughter would absolutely love the brie pizza!!! I'll need to make bigger pies--I've cut back on pizza size while my spouse is away, making smaller pies but keeping the variety--but I'd grab another bag of dough for you. 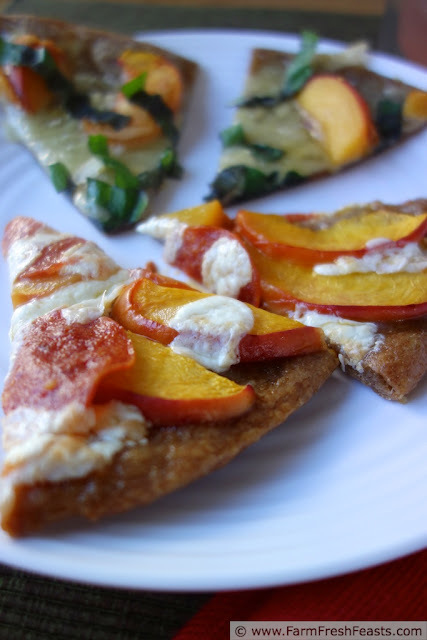 I adore peaches, but adding them to pizza has never occured to me.. What an interesting idea. Thanks for inspiring me. I think it could be my next cooking masterpiece. I'm glad to inspire. If you get creative, please let me know how it turns out. 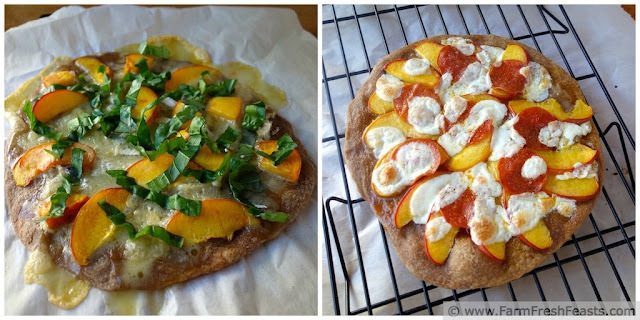 Thanks so much for including my peach pizzas in your peach favorites! I totally just died and went to heaven...more fruit pizza please! Heather, the other day--cantaloupe and that prosciutto/mozzarella roll--YUM! But it will be up next year, I need to step away from the fruit! I love to see people step out of the box with pizza. grilled fruit is so delicious with meat and I would enjoy both of these. The sweetness of the peach with the pepperoni would be heavenly (better than pineapple). Looks delicious and very interesting. Great ideas for dinner this evening and some other day! I have cooked one of those. It is an interesting recipe and it does taste good. Plus it is always good to have some new ideas for cooking either dinner or lunch on the weekend or any other day.